When my husband and I were on our honeymoon in San Pedro, Belize in May, we shared a delicious bowl of gazpacho at the Blue Water Grill. It was our final night on the island before heading inland to San Ignacio –what a delicious choice for our last meal! 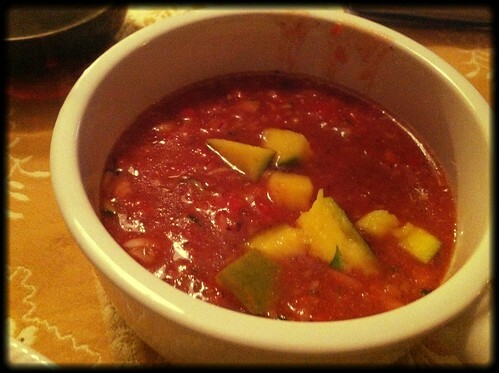 The refreshingly cool bowl of soup was welcome on the palate after a long hot day at the beach. As soon as we returned home I immediately searched, and found, an amazing recipe for the chilled appetizer by Ina Garten. This has definitely made it to the list of summer staples! P.S.Be sure to check out more #BeatTheHeat recipes listed below from fellow members of the #SundaySupper community! Roughly chop the cucumbers, bell peppers, tomatoes, and red onions into 1-inch cubes. Put each vegetable separately into a food processor fitted with a steel blade and pulse until it is coarsely chopped for a chunky soup. Blend longer for a smoother version (we prefer chunky). After each vegetable is processed, combine them in a large bowl and add garlic, tomato juice, vinegar, olive oil, salt, and pepper. Mix well and chill overnight before serving. Garnish with ripe avocado, mango, pineapple or papaya. A friend served this delicious chilled avocado soup at her summer party and my husband insisted I recreate it at home. Boy, am I glad she shared this recipe with me (thanks Kathryn!)! Not only is it extremely flavorful and refreshing, but it’s quite versatile. When I made this batch originally, I served it alongside Black Bean and Corn Quesadillas for a #MeatlessMonday dish, and then used it again later in the week as a dressing on a Taco Salad. 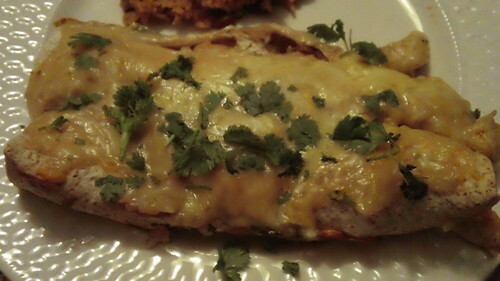 It would also be delicious as a layer in a Mexican dip, a sauce over a taco or served atop grilled shrimp or chicken. This recipe has definitely made into my list of summer staples! On a gas stove, turn a burner to high and set the poblano directly over the flame, turning it with tongs, until completely charred, 5 to 8 minutes. Alternatively, on an electric stove, heat the broiler on high and char the poblano on all sides on a baking sheet placed directly under the broiler. Put the poblano in a bowl, cover, and set aside to steam and loosen the skin. When cool enough to handle, peel, seed, and cut the poblano into 1/4 -inch dice. Heat an 11- to 12-inch cast-iron skillet over medium-high heat, add the onion and cook, turning a few times, until soft and browned in places, about 5 minutes. In a blender, purée until smooth all but 1 Tbs. 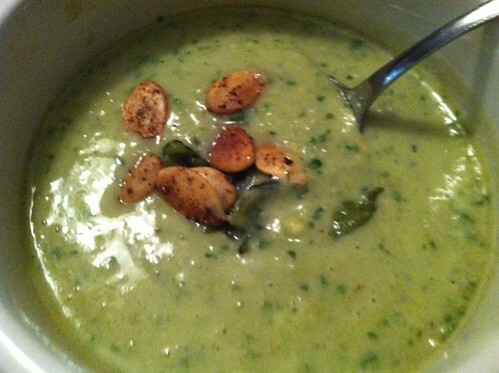 of the poblano, the onion, broth, avocado, cilantro, parsley, marjoram or oregano (if using), 2 Tbs. of the lime juice, cumin, coriander, and 1 tsp. salt. Blend in the yogurt. Season to taste with more salt. Chill well. Heat the oil in a 10-inch skillet over medium heat. Add the pepitas and cook until they begin to pop and color a bit, about 3 minutes. Add the remaining 2 Tbs. lime juice, the chile powder, and 1/8 tsp. salt and stir until the juice has evaporated, leaving a film on the pan. Season the soup to taste with salt and thin with broth if necessary. Divide among 6 cups or small bowls and garnish with the pepitas, the remaining poblano, and a few pinches of chile powder.